Economists are predicting more sluggish job growth ahead. Don't expect Friday's jobs report to swing the election. In all likelihood, it will show more of the same sluggish job growth the U.S. economy has seen for months. 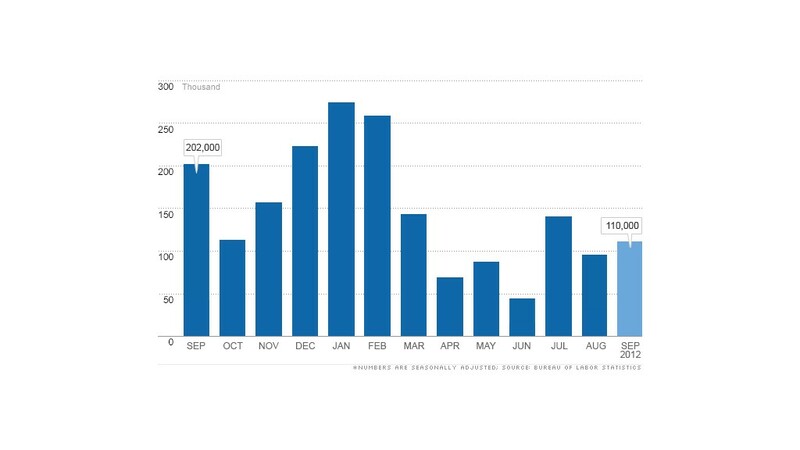 Economists surveyed by CNNMoney predict the September jobs report, released at 8:30 a.m. ET, will indicate that employers added 110,000 jobs during the month. That's a slight improvement over 96,000 jobs created in August, but over the longer term, it's not worth celebrating. Over the past two years, the economy added an average of 140,000 jobs each month. Hiring at that level is barely enough to keep pace with population growth. Unless jobs suddenly spike above 200,000 or hiring comes to a near stand-still, voters aren't "going to bat an eyelid," said Dan Hamilton, director of economics at California Lutheran University's forecast center. Not much has changed lately, and that's why economists expect the unemployment rate to remain at 8.1% in September. "The bottom line is, the labor picture hasn't materially changed in September," said Wells Fargo Economist Sam Bullard. Consumer confidence rose during the month, but that's just an indication of how consumers are feeling. Separate reports show more Americans applied for their first week of unemployment benefits in mid September, than in mid August -- a discouraging sign for job growth. Meanwhile, the same issues that held businesses back in August still kept them from hiring in September. Business owners are still uncertain what their tax rates will be in 2013. Worries about the fiscal cliff remain on the table and the election could change leadership in Congress as well as the White House. "Layoffs remain very low, but nervous businesses remain equally reluctant to hire more," said Mark Zandi, chief economist at Moody's Analytics. "The looming fiscal issues appear to be weighing on business expansion plans." Following Friday's jobs report, President Obama will probably continue to say the private sector has been adding jobs for two-and-a-half years. Mitt Romney is likely to point out that more than 20 million Americans remain either unemployed or underemployed.